If it's time to order a Scentsy replacement plug for your nightlight warmer it's very important to determine exactly which electrical base is needed or it's NOT going to work. There are actually two different types of small nightlight warmers and of course, two different electrical bases as well. Also, your Scentsy replacement plug won't work on other similar nightlight warmers that are NOT made by Scentsy! Have a look at the photos, watch the video and read below, before placing your order. Once you're absolutely sure which one you need, you are all set to buy your replacement plug. 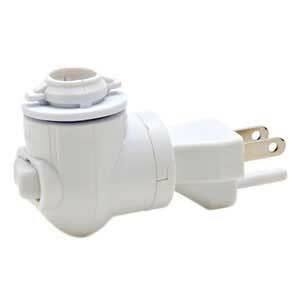 This is the replacement plug for the Scentsy ceramic or porcelain warmer. Notice, it has a twist type connection with two tabs which align with the two notches on your nightlight warmer. See the video for further instructions. BTW, it's quite rare that you'll ever need a replacement plug, but we do have them just in case. This is a replacement plug for the Scentsy glass nightlight warmer. It also works with the college mini-warmers. There's a threaded connection & screws into your warmer. See the video for further instructions. BTW, it's also rare that you'll ever need a replacement plug like this. It's very rare that your replacement plug will need to be replaced, but it does happen. If your warmer has quit working and you are absolutely sure it's NOT the bulb, they try replacing the plug. 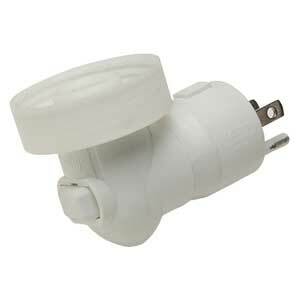 The night light replacement plug is the part of your nightlight that plugs into any standard home electrical outlet. Again, be sure to get the right plug for your night light type. Determine your night light type, glass or ceramic. See the video above for clarification. Again, depending on the plug base type, attach your new plug by screwing it in or twisting. Most of the information regarding the Scentsy replacement plugs are generally self explanatory, but most customers are unaware about the two different types of bases. We know how frustrating it is to place an order and then receive the wrong product. Our hope is that we were able to help you avoid this and make you aware of all your options. We hope you found the above information helpful and please know, we are there for you should you have any questions. Call or text Scentsy independent Consultant Mary Gregory at 661-210-7617.